Democracy in Moderation views constitutional liberal democracy as grounded in a principle of avoiding extremes and striking the right balance among its defining principles of liberty, equality, religion, and sustainable order, thus tempering tendencies toward sectarian excess. Such moderation originally informed liberal democracy, but now is neglected. Moderation can guide us intellectually and practically about domestic and foreign policy debates, but also serve the sustainability of the constitutional, liberal republic as a whole. 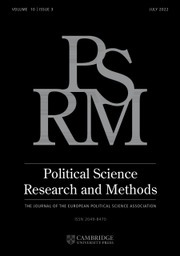 Our recent theory thus doesn't help our practice, given our concerns about polarization and sectarianism in ideas, policy, and politics. 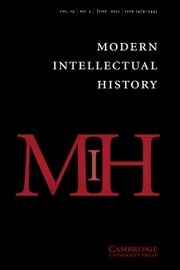 A rediscovery of Montesquieu and his legacy in shaping America's complex political order, including influence on Washington's practical moderation and Tocqueville's philosophical moderation, addresses these enduring theoretical and practical problems. Moderation also offers a deeper theory of leadership or statesmanship, particularly regarding religion and politics, and of foreign policy and strategy rooted in liberal democracy's first principles. 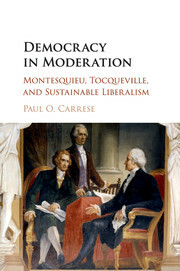 "In Democracy in Moderation: Montesquieu, Tocqueville, and Sustainable Liberalism, Paul Carrese puts the political turbulence of the present moment in perspective. The propensity toward partisanship and polarization so conspicuous in today’s politics, he observes, has antecedents in America’s founding. But also present at the founding, he argues, was a sophisticated "philosophy of moderation" that underwrote American constitutional government." 6. 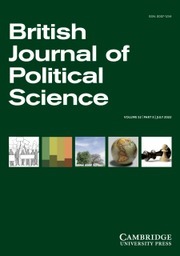 Constitutionalist political science - Storing's moderation and our polarization.